For 2016, the rental rates have been reduced by 5% to help France stimulate tourism during this difficult times. This apartment is a first class apartment, furnished with exquisite antique furniture and Limoges dishes as a self-catering holiday rental with a pool. It is located in the romantic town of Cassis on the Mediterranean Sea, part of the French Riviera, in the heart of the Provence region. The area is a paradise for vacations. For gamblers, the town has a Casino. This apartment rental is at a 7 minutes walk from the town center, the Casino & the beaches. The ocean view from the living room & the balcony is gorgeous: you see the old harbor, the 12th century castle and the 380 meter cliff (Cap Canaille). Cassis is well known for the Calanques, white cliffs between Cassis and Marseille. The old harbor is the prettiest harbor on the French Riviera, more so than Saint-Tropez, Bandol, Sanary or Monaco. This is the perfect holiday apartment for active and romantic travelers. 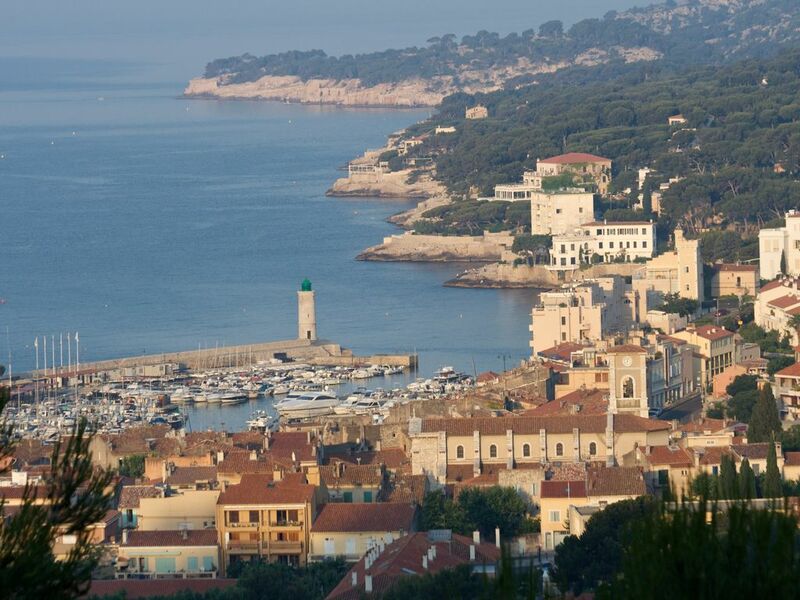 From Cassis, you can visit Aix-en-Provence, the Lubéron, Avignon, Arles, La Camargue, Saint-Tropez, Cannes, Monaco. Special Touch: Upon arrival, you will find in the refrigerator, a free bottle of water and a free bottle of wine from Cassis. No pets, no smoking: We have a No Pets policy. We have a policy of No Smoking in the apartment. Also, please compare, our rental fee also includes all taxes, cleaning before arrival & after departure, all linens, a free secure parking space for one car, soap, shampoo, tissues, toilet paper, laundry detergent and more. We offer you a fresh bottle of water and a bottle of Cassis' white wine. My wife is of Irish origin, I am French and American and we live in the New York City area. I was born in Provence and I always had loved the little harbor of Cassis. If you like the Mediterranean and the Calanques, Cassis is the place for you. If you like hiking I provide information on my favorite trails. Two (2) very spacious bathrooms. We provide shampoo, soap, toilet paper, tissue, and more. You can see the red tile roofs of the medieval village and the old church. Antique dishes for special events. The HD TV is connected to Orange, the French service provider; CNN on channel 166. Accomodate 6 people for outside eating. Yes and the apartment is handicapped people proof. Access to the pool is allowed, children must be supervised. This apartment is a deluxe, first class apartment rental. The view from the balcony is gorgeous. The bedrooms are very well furnished with antiques. The bathrooms are spacious full baths. The kitchen is well equipped. You have free access to Internet. Upon arrival, you will find in the refrigerator, a free bottle of water and a free bottle of wine from Cassis. Also, we provide all linens and you will find the beds all ready made. This property boasts a beautiful view of the Cassis harbor both from the sitting room and the deck. The home is well furnished with everything a traveler needs for a self-catering vacation. The kitchen has sufficient dishes, cutlery, cooking pots and serving dishes. The apartment is spacious and true to the internet photos supplied by the owner. A small strip mall nearby has a bakery, vegetable market and meat, fish cheese and wine shop. We very much enjoyed our stay at this property. Beautiful apartment with spectacular views of Cassis! Very comfortable and relaxing! We stayed in this apartment for a week. Upon arrival all the instructions we were sent were so clear and thorough that we really did not have any problems at all. The apartment is situated above the town and has a large balcony that overlooks Cassis. It is quite striking and such a pleasure to wake up to every morning. The apartment itself is large, very roomy and comfortable. It is also well equipped in the kitchen. We cooked several meals while there and were able to find everything we needed. The apartment is only a 7 minute walk from town, all downhill. Going back up is tough but by the end of the week we were flying up. There is lots to do in the area, hiking being one. I recommend you rent a car. The views everywhere are beautiful and there are lots of hidden beaches in the surrounding area. If you are looking for a relaxed break, with stunning views, beaches, hiking, a beautiful town, great food I think you will be very happy here. Happy travels!! Beautiful and ideal location for the town. Spotless apartment with all you need (including washing machine! ), Pool fantastic after a days walking in the surrounding area. The view from the balcony with a glass of the local vin blanc are priceless and will never be forgotten. Thank you Simon and family. Nice and clean apartment with excellent view over Cassis. The kids loved the pool and with easy access to parking and the main road you are ready to go and discover Cassis and its surroundings. We were four adults and two kids which was close to perfect for the size of this apartment much thanks to the two bathrooms. Kitchen has all you need for nice and cozy dinners at home. The owner Roland was very helpful and really does everything he can do make your stay as comfortable as possible. Thanks Roland! Overall, an excellent apartment for a nice stay in Cassis! Thank you, Maria & Johan! It was a pleasure to have you. This apartment has tremendous views of Cassis, the seaport, the sea and the surrounding calanques, a changing panorama every hour of the day from the living room and spacious deck. It is a 12 minute walk to town, though the return up the hill can be longer in the heat of the day. The apartment is very well appointed with everything you need for a holiday, and the pool is fantastic to come home to after a busy day of sightseeing. The five adults in our group were very comfortable in the three bedrooms. The kitchen was well appointed with everything one would need and the evening breezes kept the apartment comfortable at night, and night skies lovely. The owner, Roland, was very responsive and provided detailed information we needed to access the property and enjoy our stay. Parking was very tight with a larger vehicle (Citroen Kangaroo), but we always found a spot, a smaller vehicle would be a benefit. There is a great boulangerie in easy walking distance, as is a supermarket. All in all a wonderful venue from which to enjoy a beautiful area. There are a number of keys to be dealt with to access the apartment, but after learning what they all worked for this was essentially a non-issue. Lovely stay and Roland was attentive and responded to all concerns quickly. Overall a great place to enjoy Cassis! Thank you, Catherine; I hope to see you again. Once again, our stay in Roland's apartment was a stunning success. The apartment was clean and extremely comfortable and the view, as always, a welcome sight! We have been return visitors for a number of years, but this year was extra special because our son chose Cassis for his wedding! Roland's apartment was the perfect spot for us during this busy but special time! As always, his attention to detail and quick response to requests (or even suggestions) is amazing. I appreciate that Roland communicates and responds like a friend rather than a busy, absent owner. This is a perfect vacation apartment for our family with Cassis as our magical escape! Thank you Kathy & Ted!!!! Cassis is located near Marseille (a 7th BC Phocean colony) in Provence. You will find Aix and Avignon nearby where summer music and dance festivals are held. Cassis is surrounded by 'The Calanques', a national park, white cliffs around fingers of deep blue water. The Calanques are a perfect place to hike and have an afternoon picnic and bath in a secluded cove. Cassis produces a well known and delicious white wine. Also, twice a week you can go in the center of town to the local outside market for fresh produces. Most week-end, there are art expositions by local artists: painting, pottery. This beautiful apartment overlook the little harbor, the view is gorgeous. If you are interested with hiking, please let me know because I have documented a number of very interesting hikes. If the lease is cancelled 60 days or more prior the beginning of the term, all deposits are reimbursed. If the lease is cancelled 30 days or more prior the beginning of the term, all payments are forfeited unless the Landlord can find another tenant. If the lease is cancelled less than 30 days prior the beginning of the term, the rent is due for the full term.